In the course of some sixteen years, Lithuania has been fighting her occupants for the restoration of her lost freedom. The struggle is a part of that world-wide, anti-communist crusade, carried on directly by the oppressed peoples who are now being counted by the hundreds of millions. During the past twenty years the whole civilized world has been searching for the answers to the problem of freedom and slavery. If freedom in the world became accessible to some people, it was refused to millions of others. From the shores of the Baltic, along the Carpathians, and to the Adriatic £ea the Red Imperialists, having broken all their honored commitments and international agreements, maintain control over millions of once-free peoples by means of armed force and brutal terror. The Lithuanian Nation fights its battles on two different fronts: at home and abroad. The fight itself, however, is one — iust as the very idea of freedom is one and indivisible. The struggle at home is in direct opposition to the Soviet occupant. The resistance is passive as well as active. In the first case, one attempts to preserve the Lithuanian national culture; in the second, one tries to prohibit the destruction of property and the extermination of the Lithuanian people by the enemy. Europe in 1944, is carrying on the struggle through diplomatic channels in all parts of the world. All politically and ideologically minded people, young and old alike, are part of that struggle. 1. In 1940, by means of deceit and force, the Soviet Union occupied Lithuania. 2. On June 13—14, 1941, some 40,000 innocent people were deported from Lithuania to certain death in Siberia. 3. Deportations from Lithuania have not ceased. To date some 150,000 Lithuanians have been deported from their homes to the slave labor camps in the Far East. 2. Return as soon as possible our deported parents, sisters, and brothers to their native country of Lithuania." The Petition is attributed to the Lithuanian students studying in the United States. From New York in the East and Los Angeles in the West, students participated in an effort which resulted in the receipt of about 40,000 signatures in some two and a half months. Support of one kind or another was given to the whole project by all Lithuanian political parties and diplomatic consular representatives in the United States. The Petition was presented by the delegation to Vice President R. M. Nixon on June 14, 1956. In his brief speech to the delegates Mr. Nixon advised the leaders of the Soviet Union to show their sincerity by giving "to the captive countries an opportunity once again to be independent members of the family of nations." The "Voice of America" as well as The New York Times, Washington Herald, and other newspapers carried the story of the Petition to the American people and to the whole world in forty different languages. In Washington the delegation was also received by Senate minority leader Wm. Knowland (R., Cal. ), Congressman J. Martin (R., Mass. ), Sen. P. Douglas (D„ 111. ), and the Senate's Chairman on Foreign Affairs, Sen. Green (D., R. I.). 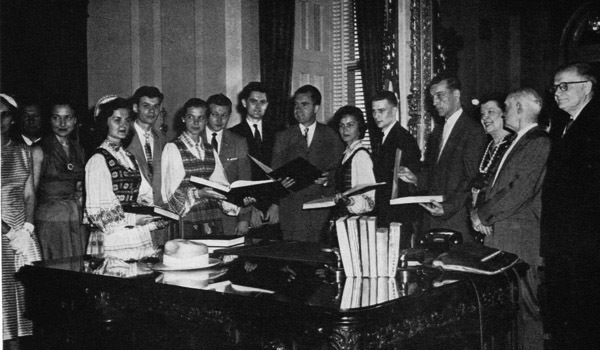 The Congressional leaders were briefed on the tragic status of the Lithuanian nation and were asked to do everything within their powers to help Lithuania in her struggle for freedom. On June 15, 1956, in a special meeting, the delegates met with Cabinet Secretary Maxwell Raab, at which time the matters enumerated in the Petition were discussed in a greater detail. 1. The U. S. Government, through Vice President Nixon, has reiterated its present position, namely, that the liberation of the enslaved peoples is one of the aims of U. S. foreign policy; that the United States will strive for a just peace and for self-determination for all nations. 2. The Congressional leaders assured the delegation that they would stand firmly behind the moves of those whose only aim is to regain freedom — a right long recognized by civilized people. 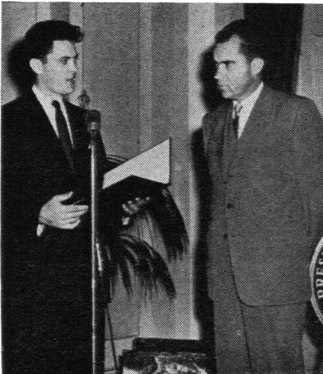 in an audience with Vice President Richard M. Nixon.